Pakistan's once most-watched cable-satellite television channel Geo, with the country's largest newsgathering network, has lost more than 80% of its viewers in less than a month, according to the BBC. In addition to Geo News channel, major cable operators across the country have blocked transmission of all other channels of the group, including Geo Super, Geo Tez, Geo Kahani and Geo Entertainment. Among the biggest advertisers, the mobile phone companies accounting for 20% of media spend on Geo group, have pulled their marketing campaigns from Geo Network, including Geo News, Geo Kahani, Geo Super and Geo Entertainment, according to ProPakistan.pk website which covers telecommunications news. 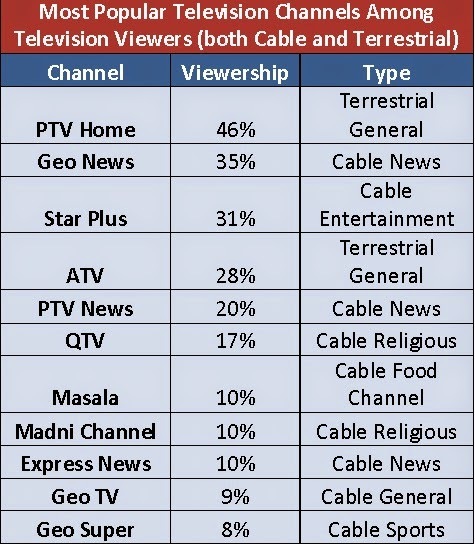 Geo News ranks number 2 and Geo Entertainment ranks 6th among cable-satellite channels in terms of viewers in Pakistan, according to Gallup Pakistan TV ratings data for 2013. Gallup report shows that India's Star Plus tops the list with an average daily viewership of around 12 million Cable and Satellite Viewers during the time period Jan-June (2013). It's followed by PTV Home and Geo News with approximately 8 million average daily Cable and Satellite Viewers. Terrestrial channels operated by PTV and ATV continue to dominate the overall television viewing in the country. 2010 data from Audiencescapes.org shows PTV Home garnering the highest market share at 46% of all viewers. Jang Media Group which owns Geo TV channels has been the biggest beneficiary of the 2002 media deregulation ordered by former President Pervez Musharraf. The Jang group is also credited with bringing down the Musharraf government with its heavy coverage of the lawyers movement to restore the former Chief Justice Iftikhar Mohammad Chaudhry. Mr. Munir Malik, one of Mr. Chaudhry's key allies, said in an interview recently that the lawyers movement could not have succeeded without the backing of Geo TV and other media outlets and civil society which grew up during Musharraf years. Jang Group has been facing rising criticism for what the critics call "sensationalism" and "irresponsible" journalism. 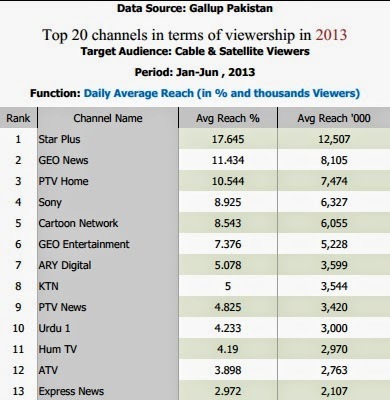 Star Plus is already #1 in viewership in Pakistan. Is this new Zee channel a Trojan horse? The Zee network will soon be launching a channel Zindagi which will only air Pakistani content. The channel, slated to be launched on June 23, will pick successful Pakistani television soaps and dramas for its Indian viewers, reported Forbes India. To test this idea, short clips of Pakistani shows were shown to families across India. The feedback reinforced the belief that these shows will work with the masses. “The market today is already being fragmented with varied classes of people opting for a variety of content. We want to make sure we have an offering for the premium mass Hindi-speaking markets. This will help us expand our audience base, tap into premium advertisers and shore up revenues in the long run,” said Punit Goenka, MD and CEO of Zee Entertainment Enterprises Limited. The audience for such content is about 40 million TV homes. India has a total of 140 million homes that watch television. In the early stages, the channel will air four hours of new programming every day; as time will progress, it will pick up content from other parts of the world as well and commission new programmes that will be produced both in India and Pakistan. Several novels are also being converted into soaps and 12 telefilms have been commissioned. Just like Pakistan, memories of classic shows like Dhoop Kinaare and Ankahi are still strong with the Indian audiences of the 1980s. However, the question is, will young viewers connect with this genre? 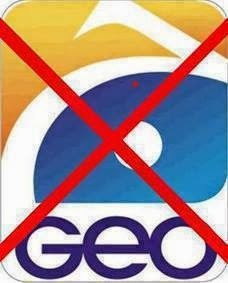 Do you realize the way Geo has been silenced, its transmission completely blocked all over Pakistan. You may revel in the power of ISI and Army to do such things, but then our Army has always been known to conquer its own territory many times over.This is Fascist and happens in dictator ship. Inaam: "Do you realize the way Geo has been silenced, its transmission completely blocked all over Pakistan. You may revel in the power of ISI and Army to do such things, but then our Army has always been known to conquer its own territory many times over.This is Fascist and happens in dictator ship." Jang Group has been the biggest beneficiary of Musharraf-era media liberalization; it;s also been the biggest abuser of this new-found freedom. No country, not even liberal democracies, allow media group's like Jang to attack not just individuals but entire institutions of the state of Pakistan. There's no equivalent of Jang Group in US or India. AlJazeera had an extremely difficult finding cable operators in US until it bought Current TV but AlJazeera America is a very tame incarnation of AlJazeera Arabic. Until 2002, Pakistan’s broadcast media was a narrow field; it had one radio station, Radio Pakistan, started in 1947 and one state-owned television channel, Pakistan Television, started in 1964; both were mouthpieces for officially slanted information, alongside privately held print media dominated by three major consortiums: the liberal Jang Group, owned by the media magnate Shakeel ur-Rahman (this group now owns the broadcast and web outlet GEO); the Nawai Waqt Group, which treads a right-wing line, and the English-language Dawn Group, the most moderate of the three (the newspaper Dawn was founded in 1941 in Delhi, India, by Muhammad Ali Jinnah, the leader of Pakistan’s independence movement, to promote the moderate ideals of his Muslim League). Then, in 2002, Gen. Pervez Musharraf decided to open Pakistan to the global flow of information in order to reverse decades of isolation. He allowed private television channels and FM radio stations to obtain licenses, setting off a media boom. Their reporting during the conflicts that followed 9/11 and spilled over into Pakistan allowed these television channels to flourish, taking viewers away from state media in favor of more independent reporting. Ironically, General Musharraf himself forced GEO off the air temporarily in 2007 when the channel criticized his suspension of Chief Justice Iftikhar Chaudhry. But today, out of office, the general once again flirts with the media as he tries to return to politics. Another descriptor is “vulgar.” On prime-time television, news is sensationalized, with ratings the first consideration; alongside hysterical reporting are thrilling or tragic music and crude, insensitive graphics; virtually everything is “breaking news” in no hierarchy of importance. Meanwhile, large corporations like ARY and the Lakson Group have acquired media companies after discovering that controlling media can protect their corporate interests. Advertisers get huge influence over what’s published or aired. Advertising breaks are frequent, and banners for commercial products run incessantly. Advertising also dominates front pages: one major newspaper group recently gave front-page ads prominence over headlines on all of its papers. Meanwhile, the government still seeks to control the media; Pakistan’s Electronic Media Regulatory Authority wants an existing law amended to permit “de-linking” of television channels from their satellites if they broadcast “objectionable” or “unwanted” material. While many in the media retain editorial integrity in the face of these pressures, Pakistani media houses have yet to come up with an industrywide code of conduct or self-regulatory body. Nor have they been able to stay unbiased. Often they blatantly take sides in political conflicts, even while describing themselves as protectors only of the public good. So, what is the way forward? Ensuring the safety and security of Pakistani journalists is the best starting point; the industry’s foot soldiers need more training, as well as job tenure and pensions. Forming unions is another necessity, as well as creating a framework of regulation that offers protection against state and corporate pressure. But what Pakistan’s media needs most is a unified sense of its own professional conscience, so that it can continue to thrive as it fulfills its ultimate duty to Pakistanis: to report the news free from bias and influence, while telling a good story that will catch citizens’ attention. A press freedom index released by Reporters Without Borders this week has called Pakistani media among the freest in Asia. Yet, the same index has listed the country as number 139 out of 180 countries for press freedom, far behind its war torn neighbor Afghanistan, which is at number 120. The reason, many Pakistani journalists explain, is that they have the freedom to report some issues, but others are considered red lines. Pakistan always had private print media, albeit with various levels of censorship during military dictatorships and the intermittent periods of elected governments. But the advent of private electronic media in early 2000s, ironically during the tenure of a military dictator General Pervez Musharraf, changed the landscape. Dozens of live 24/7 news channels started competing with each other for breaking stories and getting scoops. The country has witnessed a boost in transparency and accountability, especially in the field of governance. Officials often find themselves fielding tough questions from the media. Talk show hosts interrogate politicians on live TV every night. But the same journalists steer clear of issues that might offend either militant Islamists or the country’s powerful military. “Pakistani media faces both threats, state actors and non-state actors, and they are equally ruthless,” said Rana Jawwad, the news editor for Geo news, a popular TV channel. Journalists in Pakistan have been attacked and murdered with impunity, according to the New York based Committee to Protect Journalists. The government has often promised investigations into violence against journalists, but few culprits have been brought to court, let alone convicted. Government representatives were unavailable for comment for this report, despite repeated requests. Journalists living in the tribal areas in the country’s north, for example, face threats from the militants and the security forces fighting them. Many have fled the area or given up their profession. Similarly, journalists anywhere in the country are afraid to discuss issues that might offend the Islamists, like the persecution of certain minority groups or the controversial blasphemy laws. Reporting on a separatist insurgency in the restive Balochistan province is considered particularly sensitive. Human rights groups have published numerous reports accusing the country’s intelligence agencies of kidnapping, torturing, and killing Baloch nationalists. But the issue is almost non-existent in the otherwise vibrant media discourse. Foreign journalists are not allowed to travel to Balochistan without prior permission. The only sphere considered safe enough to raise such a sensitive issue was social media, but that impression was shattered when several bloggers who wrote progressive posts disappeared. “That was a shock for all of us, and the way it had happened because of political expression, that was also very shocking. So the results were fear all around,” said Shahzad Ahmed, country director for Bytes for All, Pakistan, a digital rights advocacy group. They eventually re-appeared after sustained protests, but most refused to name their captures. One of them, Waqas Goraya, shared his experiences at the U.N. Human Rights Council in Geneva. He believed he was detained because he ran a satirical Facebook page that was critical of the military’s role in politics and in Balochistan.